MPE Level Measurement - B&M Technical Services, Inc. The BS2000 is a fully automatic dual compressor bubbler system with bubbler tube purge, tank moisture dump, system status indication, and system fault alarms. The unit provides a 4-20mA analog output representing level for use by other devices to perform pump control or telemetry functions. Tested to UL 61010C-1, the Standard for Process Control Equipment. The Level Probes provides a rugged, safe, reliable and cost-effective means to measure liquid level for water and waste water pumping applications. The Level Probe may be ordered with one, three or ten electrodes with various spacings and two cable lengths. Intrinsically Safe for use in Class 1, Groups A, B, C, D. Class II, Groups E, F, G. Class III, Hazardous Locations when installed with Intrinsically Safe Barrier, MPE Model ISB10, in accordance with the MPE Drawing 0303. The Level Probe Relay senses liquid level and provides a relay output for controlling a pump or level alarm. The unit has two inputs, an ON and an OFF, for connection to two electrodes of a conductance probe. All setup is easily done using the DIP switches on the unit. When used for a level alarm the ON and OFF inputs may be connected to the same electrode on the probe, or the ON input may be used by itself. When used for pump control the ON and OFF inputs are typically connected to two different level probe electrodes to provide a latching function. The unit has two pump control modes, Pump Down (empty a tank) and Pump Up (fill a tank) (see table below). When in the Pump Down mode and both inputs detect liquid, the unit energizes the relay and keeps it energized until the level drops to the point where the OFF input no longer detects liquid. When in the Pump Up mode and both inputs detect no liquid, the unit energizes the relay and keeps it energized until the level rises to where the OFF input detects liquid. The Sensitivity of the unit must be set for the type of liquid being detected (see the Dip Switch table). 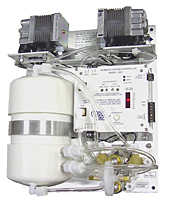 The unit provides a 10 second power up delay to prevent a pump from being turned on too soon after a power interruption. An adjustable ON Delay is provided for use as a lag pump delay. The adjustable OFF Delay is provided so that the unit may be used to provide timed off, backup pump control.